One of my chief claims to fame is my status as one of Big Ed Neusel's earliest Oak Ridge customer. I was living in the Jackson Square area of Oak Ridge 39 years ago this month when the Oak Ridger carried a story about the opening of Big Ed'sPizza a few blocks away from my apartment. I ate a lot of Big Ed's pizzas during the next year and a half before I moved to Memphis. I had no reason to go back to Big Ed's during my visits to my parents. It was, after all a pizza joint. I ate at joints in Memphis, and then in Dallas. But then some how Big Ed's got world famous. Not only that, it developed character. I recall finally returning to Big Ed's for sentimental purposes years later and discovering that it had gotten dingy. The dinginess was part of the reputation. My recollection of Big Ed's from the early days, was of the spring sun streaming into the window, lighting up Big Ed's face, as I ordered my pizza. In my memory Ed and I were the only people there. 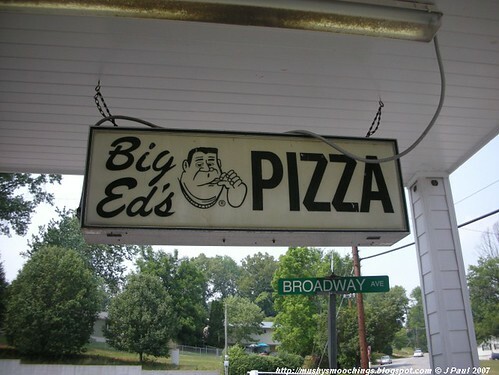 I do not recall a great tasting Pizza, but my mouth waters when I think of Big Ed's then. If I were in Oak Ridge now, I would be headed out the door, on my way to Jackson Square. It did not take Big Ed's long to develop character, to become dingy. Oak Ridge was not exactly a center of world class dining, but scientists from all over the world did visit Oak Ridge, and no doubt Oak Ridge hosts of visiting scientists, and anxious to give their distinguished visitors a bit of local color, dragged their guest to Big Ed's for a local dining experience. I wonder if Alvin Weinberg ever treated Eugene Wigner to a Big Ed's Pizza. Somewhere along the line, Big Ed turned his Pizzeria into a hangout. Ed realized that the crowd was good for business. Ed actually moved his family from Huntsville, Alabama to Oak Ridge because of the reputation of Oak Ridge schools system. Ed did not simply send his kids to Oak Ridge schools, he befriended the local high school student community. When he got enough customers to require a staff, Ed hired Oak Ridge High School students to take orders and bring beers and cokes to the tables. Big Ed's service has always been notoriously laxidasical. Of course the friends for Big Ed's staff came in and started hanging out. Hungry Oak Ridge kids had the had the money to buy Big Ed's pizzas. Once the students began to show up, their parents followed. Ed's reputation spread to outside Oak Ridge. Pretty soon people from Clinton, Oliver Springs and Knoxville started coming too. Big Ed's quickly became an institution, a place that could not be discovered because everyone knew about it. There is still a Big Ed's Pizza in Huntsville too, and but it does not appear to have acquired the mystique that Big Ed's acquired in Oak Ridge. The Soup Kitchen was after my time, but I have eaten there with my parents. i don't recall ever eating at Big Ed's with my parents. Big Ed's was (and is) a little funky for well scrubbed people to feel comfortable. They always passed the safety inspections, but I suspect that housewives looking at Big Ed's and Big Ed would have a deep instinctual suspicion that the place was not that clean. That you did not eat more than three times at Big Ed's when you were in high school says loads about who you were and were not then. I ate at Big Ed's as a young man, but I never in this life would have been comfortable hanging out there.